The 8 bass flue pipes are (6 ft, 98 Hz) G, A, Bb, B, c, d, e, and f . The general reason for such sparse piping is to save space. Making musical arrangements I am repeatedly and increasingly irritated by the 'holes'. Perhaps with century old pop music you can often make decent workarounds, but I find the missing notes being indispensable in much of more modern repertoire. The aim of the following modification is to make it possible to play the missing #G, #c, #d, and #f notes. Already Audsley (The Art of Organ Building, Vol II, p 497, fig CCCIX) outlines a remedy for this problem in a limited size house organ. In an open pipe you make a big tone hole near the top and cover this with a pneumatically operated valve cap. When the hole is uncovered the effective resonator length decreases such that pitch rises a semitone. This is the same principle as used in orchestral woodwinds, but is awkwardly clumsy due to the size of a bass pipe. The workaround used here is to do something at a pressure maximum in the pipe, instead of modifying the resonator at a pressure minimum (open end). Just below the stopper in a closed pipe, at the middle of an open pipe. At these places acoustic flows are minimum, so any holes needed may be small. Here you connect an acoustic compliance, a closed cavity. At a flow minimum (pressure maximum) the resonator air is immobile and acts mainly as a compliance, so the important property is the volume of it. So adding a closed volume here will detune the pipe lower. Suppose the original pipe has a length L. One semitone lower would require 1.0595*L, about 6% longer. So the required extra volume is estimated to be 6% of the resonator length, multiplied by the pipe cross sectional area Ap. where Lh is the length of the connecting hole (= wall thickness plus end correction) and Lp is the length of the (open) pipe. It is interesting that the required hole area does not vary too much along the tonal range. For a pipe scale halving number M=24, then Ap and Lp go in proportion, suggesting a constant hole diameter. We limit the scope to two notes only, one semitone apart. Unless voicing is extreme it should then be possible to have the pipe work for both notes with the same pressure, width, cutup, air band, frein, etc. All reasoning so far has been about the pipe fundamental. Admittedly a pipe that is detuned this way will not shape the higher harmonics exactly the same as a proper pipe of the secondary pitch would have done. So there will be some little spurious variation in timbre along the scale. Hopefully this is not very audible, anyway not nearly as much as when you deliberately replace a missing note with one that is one octave or one semitone off. The G, c, d, and f pipes are the ones modified. On each of them the tuning slots were checked/deepened such that I could tune the pipes to be one semitone high (#G, #c, #d, #f). The pipes were re-tuned to these sharp notes. On these pipes a 20 mm hole was drilled at the middle along the resonator. Boxes were made to cover the holes with a cavity of volume as computed above. When the hole is (tightly!) covered by that box, then the original (un-sharpened) pipe frequency is approximately restored. I did not care to make any adjustable fine tuning device, would only have made it more difficult to have the device airtight. 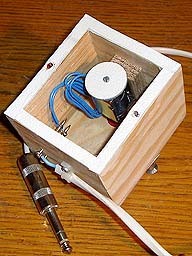 A push magnet (Schroff 12V, 68 Ohms) inside the detuner box can close the hole into the pipe, to make it speak at the sharp note. The reason to use a push magnet is that this will give its maximum force when the valve is closed. This is a definite advantage compared to using a conventional chest magnet which is designed to be held close only by its return spring and the (here non-existent) blowing pressure. The detuner valve has to cope with the oscillating pressure at the middle of the resonator. The amplitude of this is substantial, not much less than the blowing pressure. Above is a drawing and photo of a detuner box. The push magnet has its iron armature surrounded by a weak return spring, extending rightward in the drawing, resiliently stopped against a felt pad. A brass pushbar extends left of the coil when it is energized. The valve disk is held by a small screw and locking nut, threaded into the end of the pushbar. Here a photo of the rear side of the bass pipes section. 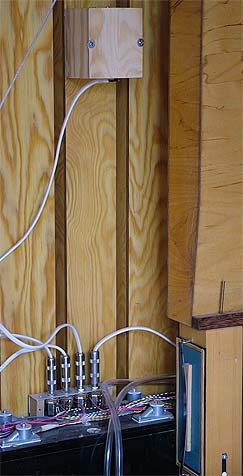 You can see a detuner box, electrically connected with a 1/4 inch telephone plug, making it easy to take a pipe out of the organ. For visibility, some otherwise obscuring bass reed pipes have been removed. From the MIDI interface 8 wires come to activate the playing valves for the eight pipes. Another four wires go to the detuner magnets. To play one of the sharp notes I have to give signals both to the playing valve and to the detuner. This is performed with diodes, such that activating one of the detuner magnets, then I also automatically open the playing valve of that pipe. The diode is to block action the wrong way round - playing a 'regular' note on its playing valve, the detuner is blocked. The phone plugs and jacks are 3 pole stereo style. I put the diodes inside the plug handles. This also insures that activating one of those sharps, the playing valve is opened only if the corresponding detuner plug is actually installed. Some care must be taken in arranging music. The reed rank on the same chest has no correspondent to the detuners, so with this only the eight original notes are available.